The mainly subject of this study was a common Ba Duan Jin (BDJ) practitioner. The plantar pressure distribution of nine distinct regions was analyzed during the execution of the one typical BDJ movements and Normal Walking (NK). The result of the experiment demonstrated that in BDJ movements, the pressure-time integral (PTI) of the 1st MTH was the maximum and greater than other parts in BDJ movements. The peak pressure (PP) of the 1st 2nd 3rd MTH and the GT were markedly greater than in other regions (p < 0.05). The center of pressure (COP) focused on the 1st 2nd 3rd MTH, and movement displacement is little. The result indicated that the 1st MTH plantar pressure of the second type of BDJ movement relative to NK a larger, to strengthen the 1st MTH and the GT region skin sensation, improving balance control. The plantar pressure distribution characteristics of BDJ movements found in this study may be one of the important factors that BDJ exercise improves elderly balance control. Every year, one-third of people aged 65 and older would probably fall (Okubo et al., 2016), so this is has become a serious health problem for ageing society. Moreover, some scientists anticipated that this condition will become more common when the 15% of the world’s population over the age of 65 by 2050 (Eduardo et al., 2015; Organization, 2008). Above all, the falls can cause some serious damage in the elderly, induce hospitalization, family medical care, and even death. Furthermore, the number of falls, the incidence of falls and the seriousness of the injury will increase with age (Nick, Petramfar, Ghodsbin, Keshavarzi, & Jahanbin, 2016; Okubo et al., 2016). The balance declines are the main reason of falls in older people (Baloh, Ying, & Jacobson, 2003). With the deepening of study on the falling, scientists has found that some suitable methods to be able to help the elderly avoid falls (Day et al., 2002; Rubenstein et al., 2008). Waldron et al., showed through the analysis of body metabolism in older people, such as impaired kidney function, anemia, electrolyte imbalances, diabetes, and thyroid disease are easily detected with these easy experimental data, and through appropriately intervention, able to markedly aid in fall prevention (Sacco et al., 2014). Johnson showed the level of nutritional risk is associated with falls, older adults’ intake proper nutrition can reduce the risk of falls (Johnson, 2003). A research showed that participation in weekly team exercises along with individual exercise at home improves balance ability and reduces the possibility of falling (Barnett, Smith, Lord, Williams, & Baumand, 2003). Elderly adequate balance control is able to perform mobility-related movements such as standing as well as doing manual works, from a chair, and NK safe during elderly daily life (Nick et al., 2016). Health comportment, such as specific physical activity, are well familiar with the beneficial effect the health of human being (Fleig et al., 2016), Most practices need to keep a maximum of a year time, and programmer demand investment of time and energy from a senior citizen. This is unlikely a popular choice (Gillespie et al., 2009; Merom et al., 2012). In China, BDJ is a traditional health care practice that concentrates on health, breathing and activity ideas, and Tai Chi exercise similar. Since the movement has eight different movements, so name for the eight. BDJ was divided into Sit BDJ, Stand BDJ, North BDJ, South BDJ, Wen BDJ, Wu BDJ, Shaolin BDJ and Tai Chi BDJ. While BDJ and Tai Chi Quan both are Chinese regimen, but their formation and development of different tendency which led them to differences in many ways, the biggest difference is that Tai Chi is developed gradually in the constant practice of martial arts, while BDJ mainly in medical practice formed and developed to achieve fitness and health needs, and the ultimate aim is the health effects of BDJ, through BDJ practice, to achieve a robust body, and the effect of longevity, and BDJ is simple and easy to learn and the action is not dramatic, is very slow, very suitable for the elderly. Practitioners often to practice BDJ can improve promotes self-control and keeping a healthy mind. At present, the study for BDJ focus on cardiovascular disease and sleep therapy and other related research, lack of balance of lower limbs of BDJ, so the study want discuss the pressure contribution of BDJ, tried to find their correlation. The purpose of this study was to examine the effect of BDJ on balance. The hypothesis for this study was that the participants undergoing the BDJ intervention would show significant improvement in balance. We recruited fifteen normal BDJ practitioners (age, 25 ± 3.8 y; height, 178 ± 5.3 cm; body mass, 70 ± 8.3 kg; the experience of practicing, 3 ± 1.8 y) with no previous injuries or diseases in recent years before this study. All subjects provided informed consent for participation in this test, which was approved by the Human Ethics Committee of Ningbo University. One typical movement was selected for analysis: light and right open bow like a shootout. Its representative movement for lower extremity exercises in BDJ. Embed plantar pressure platform of the German Novel company was used to research pressure distribution, Embed analysis system measured foot pressure for a capacitive sensor. In a 475 × 320 mm area concentrated more than 6,000 sensors, do the subjects of static measurement. All of the sensors of the equipment were separately calibrated through the calibration device before testing. Second, the typical BDJ is described as follows (light and right open bow like shootout): Both feet parallel to open, slightly wider than the shoulder, and into a horse stance. Upper body upright, and bending your arms to his chest, left arm in the upper right arm, right-hand fist, index finger and thumb are eight shaped open, the left hand gently flat push to the left, the left arm straight, while right arm elbow right back at the same time (Figure 1). The movement is testing action (light and right open bow like shootout schematic). Because two feet are symmetric to each other in the BDJ testing action, the study merely analyses the experimental data obtained right foot. In order to guarantee continuity and stability of BDJ measurement, when measurement of testing action, the practitioner was asked to complete 3 successive movements, every time repeated measurements 3 times. During testing, the practitioner was bare feet. After the measurement of the testing exercise, the practitioner was asked to walk 15m at a regular speed and repeat 3 times, and the subject plantar distribution was recorded. Before the test, the practitioner agreed on consent forms and has adequate time to warm up. Plantar pressure distribution was often used to characterize kinetic foot function and detected related to several foot-specific pathologies (Jonely, Brismée, Jr, & James, 2011). For example, greater regional plantar pressure values have been related to functional sports shoes to restore foot regular motion sequence and ability. The physical therapist can use plantar pressure distribution in the evaluation and administer of patients with all kinds of foot and lower extremity diseases (Deepashini et al., 2014). To prevent further consequences of the diabetic neuropathy, therapeutic interventions should start in the early stage (Sacco et al., 2014). In this study, parameters such as pressure-time integral (PTI), peak pressure (PP) and center of plantar (COP) to analysis BDJ movements of plantar. The PTI was indicated as the amount of continued loading through some divided plantar region. When the foot contacts the ground. Its formula as the generate of the pressure that was exerted multiplied by the loading time during which the pressure was used (Mao, Li, & Hong, 2006). Some studies used plantar pressure distribution of human lower limb movement relative to the plantar pressure distribution of NK (Cook, Farrell, Carey, Gibbs, & Wiger, 1997; Takahashi et al., 2004), this indicates that the walking plantar pressure distribution is a good characteristic of reliability and repeatability. So the study also compared to NK, in order to better explore the causes of body balance. Some studies have shown that the center of pressure (COP) in the Biomechanics of the foot is of great significance (Tai, Paik, & Min, 1999). Center of foot pressure was widely used in foot scientific research, such as the Parkinson’s disease (Rigoldi, Galli, Maras, & Riboldazzi, 2016), investigation of gait in amputees (Sinitski et al., 2016), different designs of footwear (Khoury, Haim, Herman, Rozen, & Wolf, 2015), or as an index of postural stability (Fukusaki, Masani, Miyasaka, & Nakazawa, 2016), and vestibular deficits (Allum, Honegger, & Schicks, 1994). The PP is exerted on the plantar during human locomotion and from initial contact to the leaves Emed measurement platform of generating maximum pressure. However, there have been few studies on the PP in BDJ movements. The broad consensus is that BDJ exercise improves muscle strength and balance control in the lower extremities. However, the mechanisms by which BDJ improves balance control and prevents falls in older people are still unclear. The foot was divided into 9 distinct regions: the great toe (GT), lesser toes (LT), first metatarsal head (1st MTH), second and third metatarsal heads (2nd–3rd MTH), fourth and fifth metatarsal heads (4th–5th MTH), medial midfoot (MM), lateral midfoot (LM), medial heel (MH) and lateral heel (LH) (Mao et al., 2006). In the BDJ testing movements, the average of 3 trials for each parameter was calculated and analyzed. For Normal Walking, the average of 3 right-foot steps in each of the 3 trials was used for comparison with the BDJ testing movements. Results indicate that the PTI of the 1st MTH and 2nd–3rd MTH were the 2 largest values (Figure 3) and were markedly greater (p < 0.01) than the other regions across BDJ testing movements. During NK, the PTI of 2nd–3rd MTH (p < 0.05) and the LH (p < 0.01) were the 2 largest values (Figure 3) and were greater than the other regions. Curve shows COP track and percentage expressed the time start and end in BDJ movement. Results show that the PP of 1st MTH and the GT were the 2 largest parameters (Figure 4) and were markedly greater (p < 0.01) than the other regions across BDJ movements, and the peak pressure of the 2nd–3rd MTH and 4th–5th MTH were the 2 largest values and were markedly greater (p < 0.01) than the other regions across walking. Figure 4 show the statistical results of x and y coordinates of the COP at initial and end contact with the ground and the displacement during contact when compared to NK and BDJ movement. Compared with NK, COP position was markedly displaced posteriorly at initial contact in the BDJ movement, and the x coordinates of the COP at initial and end contact were markedly less (p < 0.05) in the BDJ movements. The y coordinates of the COP at initial contact were markedly greater (p < 0.05) in BDJ movements. The BDJ movements had litter wider (p < 0.05) displacements. The PTI of the 1st MTH and the 2nd–3rd MTH were the 2 largest values (Figure 2) and were markedly greater (p < 0.01) than the other regions across BDJ testing movements, indicated of the foot pressure center closer to the medial and anterior region of planter when your feet touch the ground with the second type of BDJ. During NK, the PTI of the 2nd–3rd MTH and the LH were the 2 largest values (Figure 2) and were markedly greater than the other regions (p < 0.01), the data indicated of most of the foot load located in the 2nd–3rd MTH and heel area in the walking. Some studies suggest the foot pressure load size can affect the foot skin feedback to maintain body balance and the toe muscle activity, and the plantar pressure distribution has played a very important role in keeping balance. The 1st MTH area is one of the most sensitive areas on the foot sole, and the larger pressure located the anterior and medial foot regions may enhance the proprioceptive input from the 1st MTH (Tanaka et al., 1996). Therefore, it is expected that long-term BDJ exercise not only increases muscle strength but also enhance the proprioceptive and feedback of the anterior and medial plantar region, in order to aid in balance control. The COP trajectory time and PTI graphs. Comparison of PTI among 9 plantar regions during BDJ movements and NK. “**” indicates p < 0.01 compared with the NK, “*” indicates p < 0.05 compared with the NK. Results show that the peak pressure of the 1st MTH and the GT were the 2 largest parameters (Figure 3) and were markedly greater (p < 0.01) than the other regions across BDJ movements, and the peak pressure of the 2nd–3rd MTH and 4th–5th MTH were the 2 largest values and were markedly greater (p < 0.01) than the other regions across walking. Compared to NK, the GT and 1st MTH of the foot will be subject to the peak pressure maximum stimulation. When muscle or skin accept long-term stimulation, this area will become extremely sensitive and strong. Nurse (Nurse & Nigg, 2001) investigated the relationship between plantar pressure and the proprioception of the GT and found that there is a negative relation between plantar pressure and the sensation threshold under the GT. The proprioception of the GT degenerated with age, and the elderly are not make full use of muscles of the GT to keep balance control when an emergency happens. Shuqi Zhang (Zhang & Li, 2013) suggested that elderly people walking unstable mainly due to balance degenerated resulting from reduced foot proprioception, rather than muscle weakness. Therefore, training strength and proprioception of the GT may be better than single lower extremity strength training for physical therapy to help ameliorate the problem of balance in the geriatric population (Tanaka et al., 1996). In BDJ-second movements, body press often stimulated the GT and the 1st MTH region, so that the region skin of feedback transmission efficiency not diminished with increasing age. Because heel by the first point of contact is NK, plays a role in supporting and heel relative to forefeet a little effect on the balance, so this study without regard to the heel. Comparison of PP among 9 plantar regions during BDJ movements and NK. “**” indicates p < 0.01 compared with the NK, “*” indicates p < 0.05 compared with the NK. Compared with NK, the COP position was little displaced posteriorly at initial contact in the BDJ movement, and the X coordinates (Figure 4) of the COP at initial and end contact were markedly less (P < 0.05) in the BDJ movements, which indicates the anterior soles of the feet position has more contact. The Y coordinates (Figure 4) of the COP at initial contact were markedly greater (P < 0.05) in BDJ movements, and show that the contact ground positions were located in the anterior soles of the feet. In addition, the BDJ movements (Figure 4) had litter wider (P < 0.05) displacements. 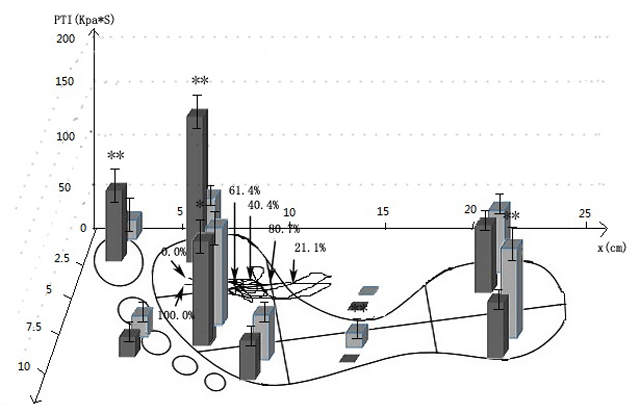 These data and COP trajectory (Figure 5) illustrated that the COP is almost in the anterior soles of the feet in the BDJ movement, and the GT and the 1st MTH can continue stimulus in the second the typical BDJ. Meanwhile, participant kept a horse pose movement during BDJ research process. There are many benefits of horse stance, for example, stay healthy and slow degradation of functions of the human body; have a certain effect on the prevention and treatment of cardio-cerebral vascular disease, osteoarthritis and lumbago and back pain, keep balance. These reflect the function of health in the BDJ movement. The GT and 1st MTH sensation inputs from the skin contribute to the adjustments needed to maintain the body part of unstable, in order to keep the body upright when other parts are moving (Annino et al., 2015). Comparisons of the X and Y coordinates of the COP at initial and end contact with the ground and the displacements during contact in the BDJ movements and NK. Values are mean ± SD. “**” significantly different than NK (p < 0.01), “*” significantly different than NK (p < 0.05). It is anticipated that the make out of the characteristics of BDJ exercise has a positive clinical relevance for people who have problems keeping balance. The findings of this study may provide useful information toward the development of strengthening programs, strategies for the prevention of falls, and the promotion of a physically active lifestyle. The results of this study may provide useful information, to help people in need falls prevention, strengthen the program and develop good exercise habits. BDJ planter pressure is larger compared to the NK in the medial and anterior part. BDJ of plantar pressure distribution characteristics can improve GT and 1st MTH proprioception, increase muscular strength and improve balance control in the elderly people. This work was supported by the ELTE Eötvös Loránd University in the frame of the ÚNKP-17-4 New National Excellence Program of the Ministry of Human Capacities. Allum, J. H., Honegger, F. and Schicks, H. (1994). The influence of a bilateral peripheral vestibular deficit on postural synergies. Journal of Vestibular Research Equilibrium & Orientation 4(1): 49. Johnson, C. S. (2003). The association between nutritional risk and falls among frail elderly. Journal of Nutrition Health & Aging 7(4): 247.